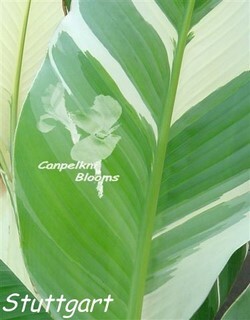 The Canna Varieties I have grown range from dwarf to giant canna plants in an array of tropical colors. 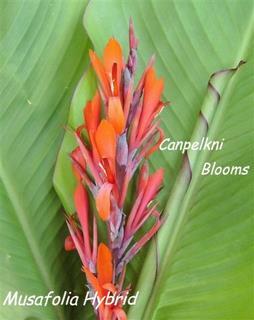 Some have insignificant flowers and are grown as foliage plants, some of the cannas are true aquatic water plants. 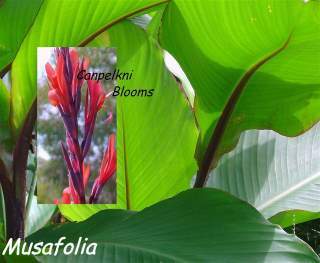 Often they are are incorrectly referred to as canna lilies. 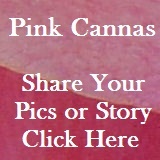 You can visit cultivator links below for pictures and full descriptions about each plant. 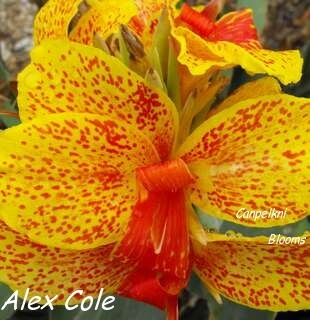 Canna Alex Cole vintage Australian cultivator bred by Charles F Cole. 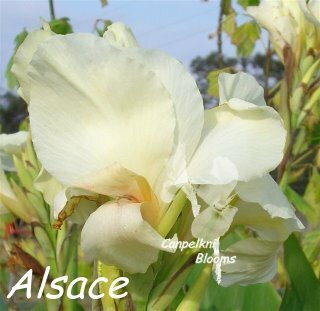 Alsace 1896 was first offered for sale as the white canna, full heads of blooms opening from pale yellow buds with some faint pink on upper labellum, flowers quickly progress through to a soft cream and finally through to a white, shows more centered pink in damp cool weather, needs warm sunny days to stay clear and white so she looks her best, canna Alsace grows up to 1.7 meters tall, seeds yes. Annjee Baby with mid soft pink blooms bordered with cream, labellum is heavily splotched with a creamy yellow tone, raised in Australia 2006. Easily grows to one meter tall above green foliage and sets seed. 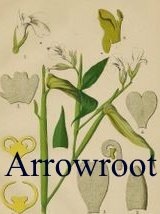 Recent new release of this very rare Australian cultivar. 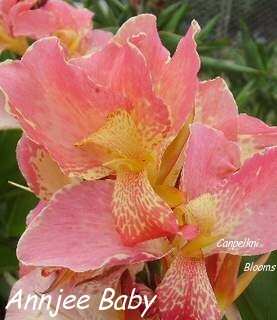 Canna Annjee Baby is a seedling from the beautiful but much darker pink canna Annjee. 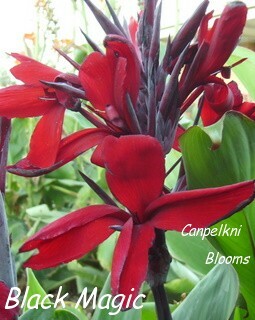 Canna Black Magic from black buds Black Magic shows its unusual velvety dark blood red and elongated flower held above green foliage, a medium growing canna reaching 1.2 meters tall. 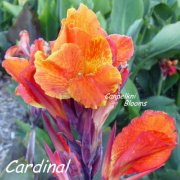 Canna Cardinal, with distinctive big blooms of orange n scarlet heavily overlaid n spotted, broad dark foliage, grows up to 1.1 meters tall, another of the canna varieties raised by Bernard Yorke. 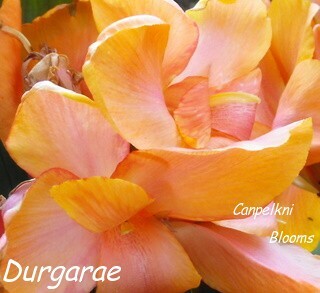 Durgarae from golden apricot blooms to soft apricot n pink with irregular placed pink bleeding that only seems to be consistent on and near the edges of the staminodes, labellum and stamen beautifully shaded too, dark bronzed over green foliage, 1.4 meters tall, raised 2007 by me, Raelene. 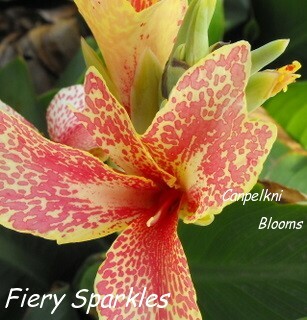 Fiery Sparkles was raised in Australia in 2006, is very heavily marked with elongated pink splotches over pale yellow through to cream blooms, green foliage, canna Fiery Sparkles can eventually grow up to 1 meter tall. 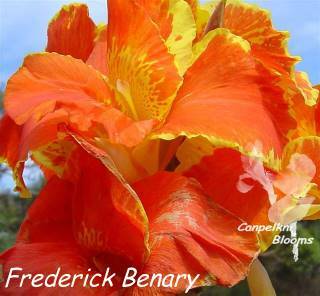 Frederick Benary seldom seen heritage cultivator with Big BIg BIG blooms of dark apricot orange that progress through to a soft overlaid pink tone, heavily splotched golden yellow throat and mottled stamen trimmed again in golden yellow, giant canna around 2.3 meters tall, green foliage, seeds no. 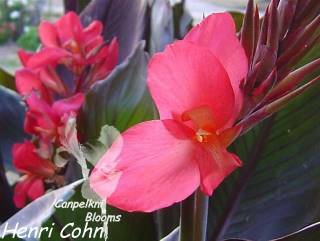 Henri Cohn stunning canna with dark radiant rose pink blooms with some cream brushed on upper labellum, blooms are held above prominent ribbed dark bronzed foliage over dark olive green, 1.8 meters tall, one of the best dark pinks on a dark leaf. 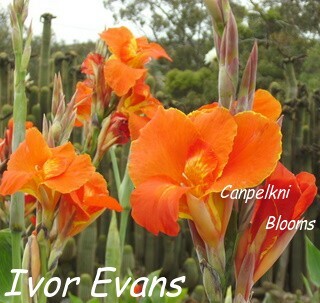 Ivor Evans a heritage canna with big blooms of apricot orange with a yellow splotched labellum and stamen, blooms have a irregular yellow trim, in the heat of summer Ivor Evans presents his flowers as dark redish orange, green foliage, easily grows up to 2.1mtrs tall in the garden. 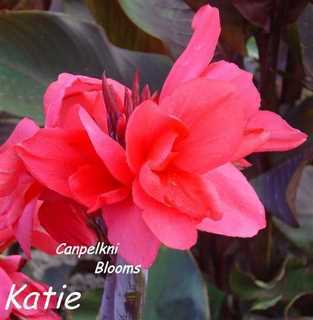 Canna Katie, with rich dark pink blooms held above dark olive green foliage heavily overlaid with burgundy, stems and midrib are burgundy too, Katie grows up to 1.2 meters tall in the ground, a superb dark leaf with pink flowers of the canna varieties. 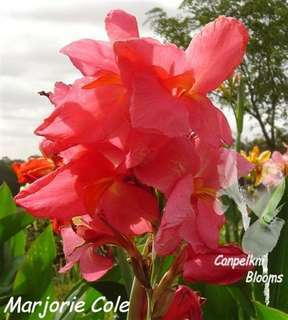 Marjorie Cole another of the Australian heritage canna varieties with pretty rose pink blooms with the slightest flush of salmon, her throat and stamen also show slight feathering of salmon over cream, flowers are fine with a distinctive crinkle in them, green foliage, canna Marjorie Cole is a dwarf small canna, the maximum height I've had her grow was 0.9 meters tall. 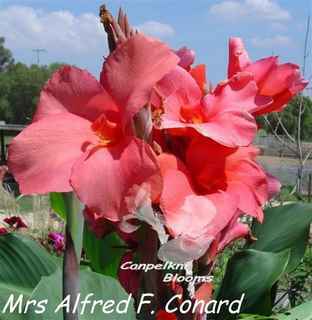 Canna Mrs Alfred F. Conard has beautiful big flowers of rich salmon pink held well above green leaves, for me she has grown up to 1.4 meters tall, like your canna varieties BIG and bold? 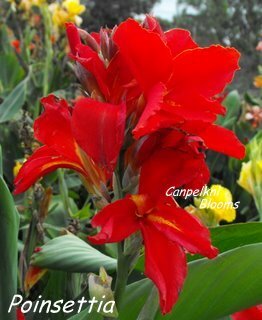 then this is a beautiful canna for you. Canna Musafolia, foliage plant with huge leaves of dark green with red margin, dark burgundy red stems and red under leaf midrib, simple dark red flowers are shown late in the growing season, this canna is popular for its foliage not its flower, extremly tough and drought hardy, about 2.2 meters tall here however a friend has this same cultivator reaching well above 3 meters tall in the garden, raised in France around the 1860s. 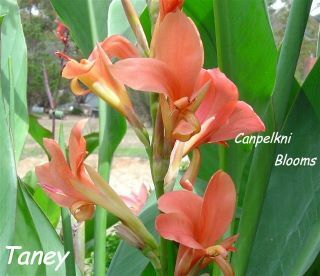 Canna Musafolia hybrid, green foliage with slender mid brown stems and midrib, new leaves display a dark burgundy margin, very early and free flowering constantly with simple orangey red bloom and increases very well, reaching 1.6+ meters and extremely dry tolerant. 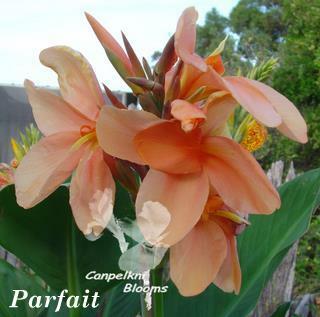 Parfait raised in Australia, unusual shade of soft to mid apricot blooms with green foliage, medium grower at 1.2 meters tall. 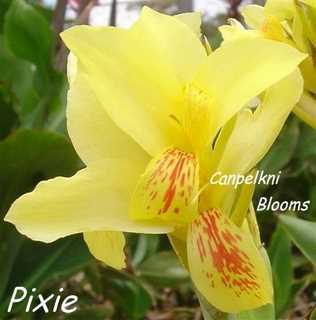 Canna Pixie has soft toned butter yellow blooms, labellum heavily splotched red, just reaches up to 1.1 meters tall, green foliage. 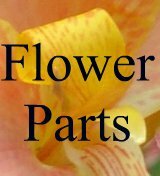 Poinsettia has clear bright red flowers that show a very fine golden yellow irregular trim and golden yellow feathering on labellum and stamen, canna Poinsettia is one of the growing short canna varieties reaching up to 80 centimeters tall with green foliage. 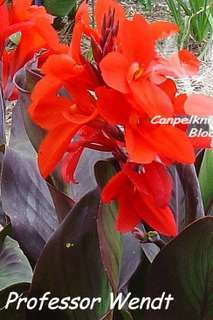 Professor Wendt has deep red blooms with magnificent dark purple toned foliage over green which is common in the dark leaf canna varieties, canna Professor Wendt grows upto 1.4 meters tall. 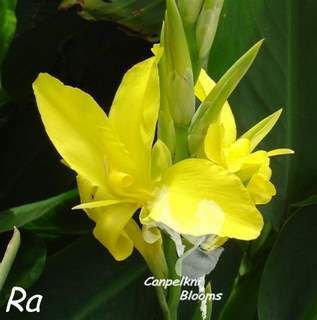 Canna Ra raised in USA by Robert J. Armstrong -early 1970, Ra is third in the series of the four Aquatic cannas from the famous Longwood Gardens. 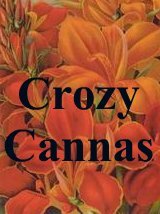 Ra displays a mass of bright yellow blooms held above slender blue-green foliage, 1.7 meters tall and grows equally well in garden ponds potted then submerged, as marginal’s or garden beds as mine were. 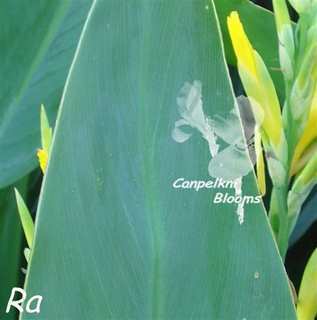 Canna Ra is one of the 4 Aquatic canna varieties from Longwood Gardens. Ra was named in honour of the explorer Thor Heyerdahl's water raft. Strawberry Candy, 1 meter tall, raised approx 2006 by Raimunda. Short n Spotty, under 60cm, raised approx 2006 by Raimunda. Stuttgart a spectacular foliage plant of large blue green leaves with irregular variegated foliage of silver, cream to white, at the end of the season as cooler weather starts foliage appears more of a yellow cream than white, pale apricot to pink flowers, up to 3.1 meters tall, discovered in Stuttgart Botanical Gardens Germany. 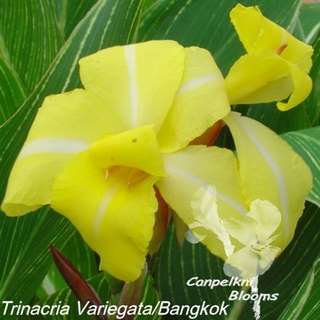 Canna Trinacria Variegata also known as canna Bangkok. 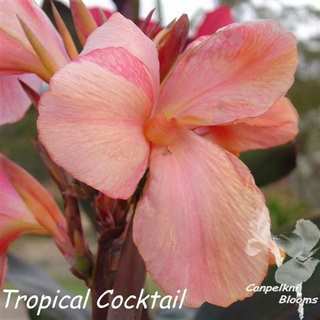 Tropical Cocktail a beautiful canna with soft apricot blooms irregularly overlaid with soft pink all held above bronze foliage over dark olive green, canna Tropical Cocktail was raised in Australia and grows in the garden up to 1.5 meters tall. 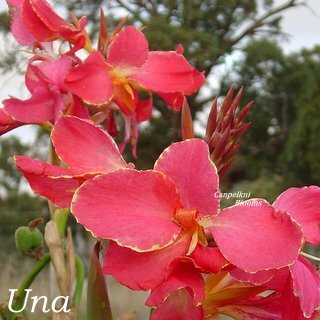 Canna Una has many rose pink blooms with an irregular golden yellow trim, flowering heads eventually cascade downwards from the weight of her many blooms, up to 1.7 meters tall, green foliage, she starts flowering early in the season and if it wasn't for Victoria's frosty winters she would keep going on and on, one of the best pinks. 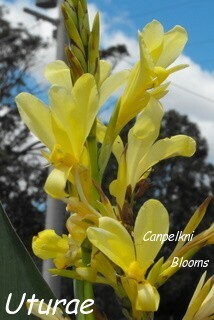 Canna Uturae with slender and pale butter yellow blooms held well above green foliage and grows upto 1.9 meters tall and raised in 2007.